Biography of French Impressionist painter. no obvious relationship to the others. A French painter, he was present at the beginnings of Impressionism, but his death at an early age prevented him from witnessing the height of this movement. He was from a well-to-do family from the Portestant middle class and studied medicine in Montpelier. In 1862, when he went to Paris to study for his doctorate, he gave everything up to devote himself passionately to painting. He entered Gleyre's atelier, made contacts in artistic circles, and met Pierre-Auguste Renoir (1841-1919) and Claude Monet (1840-1926). An enthusiastic adherent of plein-air painting, his work focused on landscapes, still lifes and portraits. However, he primarily investigated the human figure in the open air and it's relation to the natural world and the landscape. 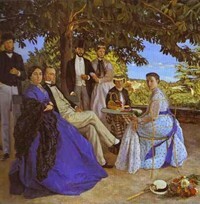 Examples of this interest are seen in The Pink Dress (1864, Musee d'Orsay), and the painting that is considered his masterpiece, The Family Reunion (1867, Musee d'Orsay), also known as The Artist's Family. He did two versions of this painting and exhibited it at the Salon in 1868. His compositions are usually very structured, with broad brush strokes, in which the figures seem to be in front of a photographer's lens. He was also interested in representing female nudes in the open air - Summer Scene (1869, Fogg Art Museum, Harvard University) is an example - a subject shared by nearly all of the Impressionists. Brazille's style departed somewhat from other Impressionist paintings, such as those by the Impressionist Monet, since he considered form and volume as elements that were necessary parts of his paintings, an aspect that the Impressionists obviated. 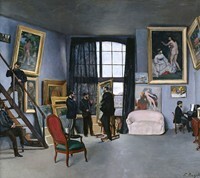 His brilliant and well-known painting The Artist's Studio (1870, Musee d'Orsay) reveals the intellectual and artistic context in which Brazille worked. The artist himself appears, being painted by Monet, together with the painters Renoir and Manet (1832-83), the writer Emile Zola, and the musician Edmond Maitre. His premature death as a soldier in the Franco-Prussian War cut short a highly promising artistic career. One day towards the end of 1862, Monet and Renoir were toiling in the studio of the Swiss painter Charles Gleyre (see also: Impressionism: Early History) when they were joined by a tall young man - well-dressed and obviously of good family - the sort (as Renoir put it) who gives the impression of having had his valet break in his shoes for him. This was Frederic Bazille, from Montpelier deep in the south of France, where his family were wealthy landowners. He had started to study medicine there, but then persuaded his father to let him come to Paris and enrol at Gleyre's studio, on condition that he kept up his medical studies in the afternoons. His stylish manner and provocative conversation made him popular at once. Zola, when he met Bazille, called him "haughty, formidable in argument, but essentially good and kind." He was already telling everyone that big, classical compositions of the sort usually favoured by the Salon were on the way out, and that the future lay in everyday scenes of ordinary people. He began following Monet's practice of landscape painting in the open air, notably in the forest of Fontainebleau, in the Easter holidays of 1863. Meanwhile, he continued studying medicine but with less and less effort. (He failed his exams two years later.) That summer, Monet introduced him to his native Normandy, where they painted around Honfleur. By now, he and Monet were often painting together. Bazille appears twice in Monet's Dejeuner sur l'Herbe (1866), once as a standing figure at the left, and again lying on one elbow to the right. When Monet injured his foot and retired, furious, to his bed at their country guest house, Bazille, to keep him quiet, painted him propped up on pillows, visibly disgruntled. The work (Monet After his Accident) now hangs in the Musee d'Orsay in Paris. Back in his own studio, where Renoir was now also installed, Bazille wrote to his parents: "Monet has fallen upon me from the skies, with a collection of magnificent canvases". When he moved to a new studio in the winter of 1867, taking Renoir with him, Renoir painted him in his studio, busy with a still-life of a heron - Frederic Bazille at his Easel (1867, Musee d'Orsay). Bazille reciprocated with Portrait of Renoir (1867, Musee d'Orsay). As a close friend of Bazille, Renoir remembered those days well, and the day-dreams they shared. "He had a great deal of talent, and courage, too. You need plenty of it when you have money, if you want to avoid being a society man." Bazille had already visited the Impressionist Manet, with whose family his parents had a slight acquaintance, in his studio, and was well-informed of his work and artistic ideas. It was Bazille, too, who first brought the young Englishman, Alfred Sisley (1839-1899), to Gleyre's studio. Camille Pissarro (1830-1903), another Impressionist-in-the-making, was also introduced by Bazille, through Manet. Bazille and Monet appear to have sat side by side on the beach at Le Havre in 1865, painting an identical stretch of coast under a lowering sky, with small boats sailing in the choppy water. Bazille was beginning to admire his friend's paintings so much that he purchased his canvas Women in a Garden (1866). In return, Monet helped him with a piece of portrait art - namely, a large group portrait of his own family, posing on the terrace of their summer house outside Montpelier. The work - The Family Reunion (The Artist's Family on a Terrace) (1867, Musee d'Orsay) is probably Bazille's most famous painting and was exhibited at the Salon of 1868. In 1869, the Salon accepted his View of the Village, in which a young girl in a red sash sits under a tree overlooking a town in the south of France which is bathed in sunlight. The artist's friends were enthusiastic: Bazille had succeeded in placing a figure, with complete naturalness, in an outdoor setting. His Summer Scene of the same year, featuring a group of young men disporting themselves around a pool, was exhibited at the Salon of 1870. Though still some distance from the oil painting of Monet and Renoir of that period, its combination of figure drawing and scenic naturalism makes it perhaps Bazille's most individual work. It is a celebration of manly exercise in which the healthy bodies occupy a natural place in a summer landscape washed with light. In the same year, reverting to exotic romanticism of Delacroix, he painted Black Woman with Peonies, which seems to hark back to the masterpiece which helped to set French painting on its revolutionary course: Manet's Olympia (1863, Musee d'Orsay). The black servant in Manet's picture, bearing her bouquet of flowers, is transmuted in Bazille's imagination to a subject in her own right. Another famous work which he completed at this time was Bazille's Studio (1870, Musee d'Orsay), in which the tallest figure (the artist himself) was actually added by Monet after Bazille's death. Bazille's mind was full of ideas for group shows, which he passed on to his family in a letter written in the Spring of 1867. He would not send anything more to the Salon, he had decided: it was ridiculous to be exposed to the whims of mere administrators. "A dozen young men think the same way as me", he declared. He was referring to the three friends at Gleyre's (Monet, Renoir and Sisley), together with Pissarro, Manet, Berthe Morisot (1841-95) and Edgar Degas (1834-1917). Bazille listed some of the painters who would be invited to exhibit with them, such as Gustave Courbet (1819-77), Camille Corot (1796-1875) and the Barbizon painters Narcisse Diaz (1807-76) and Charles Daubigny (1817-1878), adding "with these people, and Monet, who is stronger than all of them, we are sure to succeed." Unfortunately, Bazille and his friends were not able to raise the necessary funds to purchase their own studio, so the idea had to be dropped. All the same, the notion of a kindred group of modern artists, all moving in the same direction and with similar ambitions, refused to die. In that first, excited idea was the germ of what later became a reality - a fraternity of Impressionist painters, of varying skills and tempraments, who would exhibit their work together, rejecting the traditional art channels, sinking their differences in a common cause. For more about the early history of Impressionist art, see the following: Impressionism: Origins, Influences; and Impressionist Painting Developments. For shows, see: Impressionist Exhibitions in Paris. Whether Bazille would have remained in the vanguard of such a loose style of modern art is open to question. Despite his close ties with Monet, Renoir, Sisley and the rest, his work contains a residual conservatism, a hesitancy, that he might have found difficult to eradicate from his painting. As it is, his compositions demonstrate a freshness, great attention to detail, a keen appreciation of anatomy, and realistic facial expression. In the summer of 1870 Bazille joined the army to fight the Prussians. On November 20th, 1870, on an icy road at Beaune-la-Rolande, South of Fontainebleau forest - the birthplace of the Barbizon School of landscape painting - he was killed by a snipers bullet. They buried him under the snow. His father travelled from Montpelier to find his body and brought it home in a cart. Works by Frederic Bazille can be seen in several of the best art museums in France and elsewhere. Here is a short selection of his most famous canvases. - Pink Dress (1864) Musee d'Orsay, Paris. - Monet After his Accident (1865) Musee d'Orsay. - The Family Reunion (1867) Musee d'Orsay. - Portrait of Renoir (1867) Musee d'Orsay. - Summer Scene (1869) Fogg Art Museum, Harvard University. - La Toilette (1870) Musee Fabre, Montpelier. - The Artist's Studio (1870) Musee d'Orsay.